Battling an illness can be physically and emotionally difficult, for Man and Man's Best Friend. We value the importance of helping our canine companions who in turn help us. Therefore, we offer training and certification for therapy dogs so they may provide comfort back to their community and share the love. We take great care in training our therapy dogs, and supporting efforts in curing cancer is of the upmost importance to us. We happily volunteer our time, money, and services to help ensure that anyone battling cancer, human and animal alike, feels cared for at the deepest level. 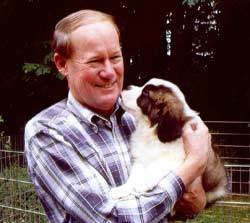 Our founder, Stan Stearns, offers more than just his time in helping to cure cancer. His company, VICI Valco Instruments, was vital in helping to develop new and innovative tools for cancer treatment. At our core, we are dedicated to doing what we can to bring about the cure for cancer. ​​​The Gabriel Institute was founded by Stan Stearns, Gabe's best friend and the founder/president of Valco Instruments (VICI), a Houston-based manufacturer of analytical components and systems. VICI makes the world's smallest components for gas and liquid chromatography, flow injection analysis, and related techniques. 800-900 new cases of osteosarcoma are diagnosed in the United States every year. While people of any age can develop osteosarcoma, teens are the most commonly affected age group. Osteosarcoma most often occurs in the long bones that make up the arms and legs.